Hypoxia, or low dissolved oxygen (DO) caused primarily by excess nitrogen loading has been identified as the issue of greatest concern for water quality in Long Island Sound (LIS). To address the excess nitrogen, and resulting DO problems, the Connecticut Department of Energy and Environmental Protection (CTDEEP) and New York State Department of Environmental Conservation (NYSDEC) developed A Total Maximum Daily Load Analysis to Achieve Water Quality Standards for Dissolved Oxygen in Long Island Sound (LIS TMDL) that outlines nitrogen reductions necessary to meet water quality standards in the Sound. The U.S. Environmental Protection Agency (EPA) approved the LIS TMDL in 2001. The Connecticut River Nitrogen Project was a cooperative effort involving staff from NEIWPCC, the states of Connecticut, Massachusetts, New Hampshire, and Vermont, and EPA’s Region 1 and LIS offices. The Connecticut River Workgroup focused its efforts in better understanding nitrogen loading and transport from the Connecticut River watershed to LIS. 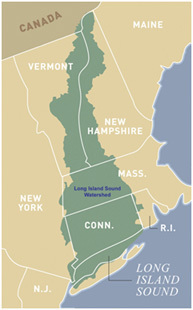 In 2010, the Connecticut River Nitrogen Project merged with the LIS TMDL Workgroup. Coordinated by NEIWPCC, the LIS TMDL Workgroup consists of representatives from the Sound’s five watershed states including staff from the CTDEEP, Massachusetts Department of Environmental Protection (MassDEP), New Hampshire Department of Environmental Services (NHDES), NYSDEC, and Vermont Department of Environmental Conservation (VTDEC). The workgroup also includes representatives from EPA’s Region 1, Region 2, and LIS office. The LIS TMDL Workgroup was established to carry out the LIS TMDL’s phased implementation plan through a five-state watershed process. The plan includes commitments to reevaluate nitrogen reduction targets periodically and revise the LIS TMDL plan accordingly. The LIS TMDL reevaluation process has been underway since adoption of the original LIS TMDL. The phased implementation plan schedule for the LIS TMDL calls for a reevaluation of the allocations based upon advances in monitoring, modeling, research, implementation, water quality criteria, and other factors. That reevaluation is currently supported by the Long Island Sound Study (LISS). A future revision of the LIS TMDL may include updated nitrogen allocations for both lower basin sources (CT and NY) and upper basin sources (MA, NH, and VT). Continue implementation of nitrogen reductions from wastewater treatment plants (WWTPs). This includes continued upgrades and optimization work in the CT and NY portions of the watershed. This also includes capping WWTP nitrogen loads, monitoring nitrogen discharged from WWTPs, and the completion of nitrogen removal optimization studies at WWTPs in the MA, NH, and VT portions of the LIS watershed. Work on this element of the plan is ongoing. Complete a preliminary evaluation of current stormwater and nonpoint source control efforts with a goal of qualitatively assessing their adequacy for meeting the 2000 LIS TMDL load reductions for stormwater and nonpoint sources. This element of the plan has been completed (see next section for detail on the resulting report). Develop and implement a feasible tracking system to evaluate attainment of nitrogen load reductions from nonpoint source and stormwater best management practices. Work on this element of the plan is ongoing (see section on Tracking & Accounting of Nonpoint Source & Stormwater Best Management Practices below). The report completed under part two of the Enhanced Implementation Plan for the Long Island Sound Total Maximum Daily Load is a preliminary and qualitative evaluation of the adequacy of current stormwater and nonpoint source nitrogen control efforts in achieving the LIS TMDL for DO. This qualitative analysis is based on (1) nitrogen loading trends, (2) changes in drivers of nitrogen loading, and (3) the scope and effectiveness of on-the-ground nonpoint source and stormwater nitrogen control efforts. Each of the five watershed states completed a section of the report. NEIWPCC prepared the watershed synthesis section of the report, which serves as a synthesis and evaluation of TMDL-related implementation efforts at the state and watershed level. Elements of the report are linked below. This study, completed March 2015 by JJ Environmental, LLC, assessed the feasibility and cost-efficiency of installing low-cost biological nitrogen removal retrofits at select WWTPs in the upper LIS watershed (MA, NH, and VT). This is a multi-phase effort to develop and implement a feasible tracking system that will allow for quantitative TMDL evaluations of the attainment of stormwater and nonpoint source nitrogen load reductions, as required by the TMDL. The first phase, completed April 2014 by WaterVision, LLC, involved evaluating existing tracking and accounting systems and making recommendations on the general framework for the LIS tracking system. Throughout the course of the LIS TMDL effort a number of technical projects have been completed. The final reports from technical projects are linked below. For more information, contact Richard Friesner, coordinator of our Long Island Sound TMDL workgroup at rfriesner@neiwpcc.org.